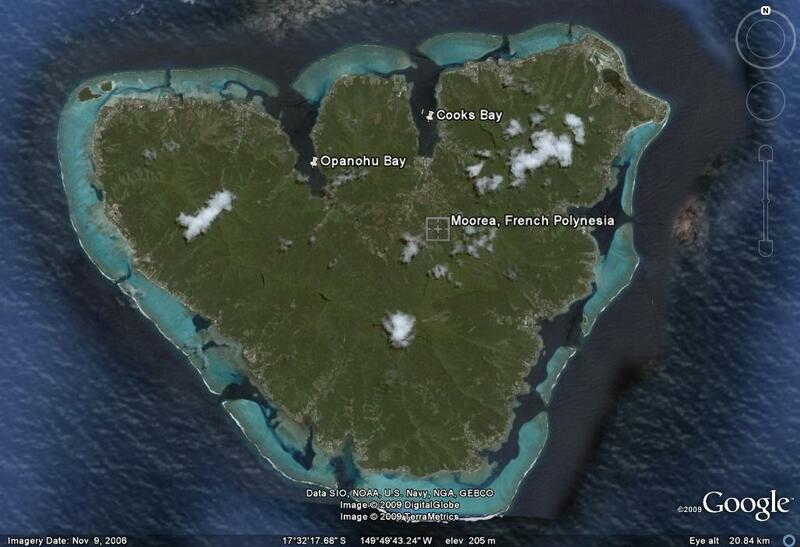 It’s about 18 miles from Papeete to Cook’s Bay on Moorea. When all our chores were finally done and we headed across the southerly winds and big south swell were running pretty high, making the anchorage at Papeete uncomfortable and the one at Moorea very inviting. We sailed across and dropped a hook in a sandy spot just inside the pass near Cook’s Bay. The passes in the Society Islands are much more mellow than the passes in the Tuamotus for a couple of reasons. First, the Societies are still islands and not just empty lagoons that fill up with water, so the amount of water inside the barrier reef is much less and the resulting current is less. Also, the Societies are on what’s called an amphidromic point, where tides are minimal and the water level difference is only 8 inches between high and low tide. The southerlies ended and we moved into Cook’s Bay and decided to go for what the travel guide described as “an excellent day hike” on a shaded three hour trail. We took a shuttle around the island to the ferry terminal and walked inland on a road that eventually turned into a trail up the mountainside. And up it went. It was definitely the steepest trail we’d hiked in a long time. But in about 90 minutes we were at the top on a ridge with beautiful views where we rested and had lunch. We knew we were a bit slow getting up to the top and guessed we’d have another two hours to get back down. Yeah, not. Somehow we must have missed a right turn. The guidebook only said “on the way down avoid taking the wrong turn at a bamboo grove”. But it didn’t say what the right turn was, and apparently we took the wrong one. After traversing the valley on a lovely trail for another three hours we finally found a road. Unfortunately it went down to the wrong bay. When we got to the road that connects the two bays we stuck out our thumb and the third car had room to take us the 5 miles back to Cook’s Bay. It was a very long day, but we definitely saw lots of Moorea. The northeasterlies started blowing pretty strong, so we moved around into Opunohu Bay looking for some shelter. We wanted to dive on the outer reef and had to wait for the wind to settle down. Yesterday it was finally calm and we hauled out the dive gear, threw it all into the dink and went out the pass to the buoys the commercial dive boats use. As we descended we were literally swarmed by fish. It’s obvious that the local divemasters feed the fish to amuse their customers. Everything on the dive was looking for a handout, including a huge mooray eel who came half out of his hole looking hopeful, and a 4′ black tipped reef shark who swam with us the entire 40 minutes we were down (I named him Sammy). There were two enormous turtles snacking on the reef that weren’t bothered by us and we swam with them for about 10 minutes. I’ve never been 5′ from a turtle before and could have swam up and grabbed ahold and gone for a ride, but I really didn’t want to bother them. Sadly though, the coral was nearly all dead. It would have been an incredible dive if the coral had been alive, and it didn’t look like it had been dead for long like the reefs in the Caribbean, but there were scarcely few places where it was healthy. We were extremely happy we had done the dives in the Tuamotus and seen coral reefs still spectacularly healthy because apparently here they’re not. Last night we were going to leave for the northern Societies, which are just far enough northwest that we have to travel overnight in order to arrive during daylight. But a front was passing through and it was cloudy and rainy in the afternoon when we should have been getting ready to leave, which did not inspire us to get ready and go. The winds were forecast to be light overnight and the thought of motoring all night in the rain didn’t have much appeal. Of course as soon as it got dark the skies cleared and the wind started howling. We ended up with 25 knots of wind for most of the night in the anchorage, which was really noisy and unpleasant given that we were anchored in a narrow slot between two reefs (definitely between and rock and a hard place). This morning the sun is back out and the winds seem to have settled back into a southeasterly, which is the normal direction for the trades. So we moved back into Cook’s Bay so I can upload some pictures to the website. 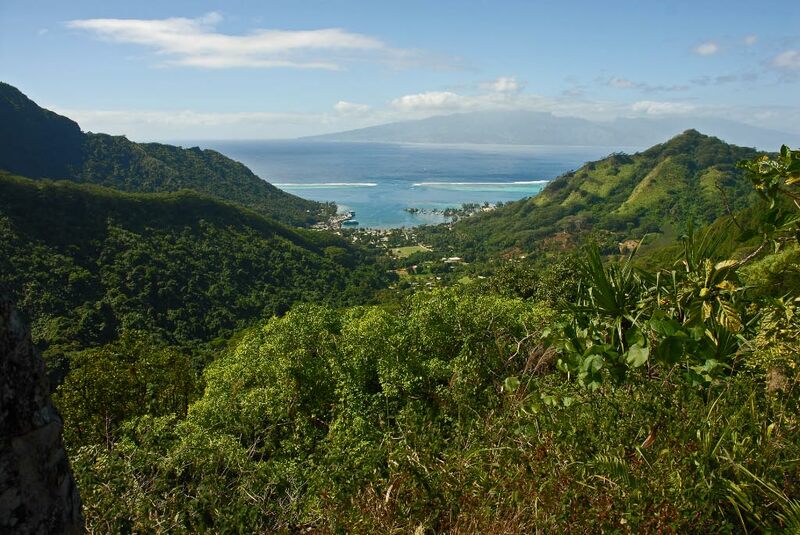 Tonight for sure we’ll hoist sail at sunset and make our overnight passage to Huahine. I’ve been studying the weather down here for a long time and am finally starting to understand a little bit of what’s going on. There are definitely lots of factors down here that affect the weather differently than in the northern hemisphere; the primary one being that there are no huge continents. The forecasters here are now nearly officially calling this an El Nino year, which for us is ok. What it means is the trades will be lighter than normal, which we’ve already experienced all the way from the Galapagos. It also means the south pacific convergence zone (the area where the southeast trades bump into the equatorial easterlies) will be further north than usual. That makes our choice to visit the southern Cook Islands a good one, but might make a visit to Niue and Samoa difficult and unpleasant. So far we’ve enjoyed the Societies and look forward to our last 17 days in French Polynesia before our visas expire. I was hopeful that since we’ve got our international zarpe already, maybe we could cheat a little bit in Bora Bora and not quite get underway on time. But this morning the local Gendarme boat came by and four guys came aboard and checked all our papers and passports. Guess we’ll have to play by the rules afterall.